But seriously, like all things in this beautiful, fascinating world (organic cold brewed coffee, fair trade dark chocolate, or a BMW M6 Gran Coupe), some wonderful things just don’t have a place in everyone’s life… or tummy…. or garage, for that matter. Butter coffee is one of these powerful substances that under certain circumstances, can lose its beneficial properties. If butter coffee isn’t always the satiating elixir that it is touted to be, why did you develop an entire 7 day (free!) detox & meal plan around it? Most modern breakfast foods consist primarily of carbohydrates & sugar. Think about it, even “healthier” breakfasts such as greek yogurt are filled with sugar to make them palatable, and often times are topped with granola or cereal. The combination of grass fed butter, MCT oil, and collagen protein powder is a skin rejuvenating trifecta. Vitamin K2, a fat soluble vitamin (meaning it is requires dietary fat consumption in order to be absorbed), is found in grass fed butter. So why is this important in regards to supporting heart health? Vitamin K2 ferries calcium OUT of the arteries, and INto the bones… where we want it to be… While we’ve spent years blaming cholesterol and saturated fats for heart disease, our finger pointing would have been more appropriate directed at a deficiency of this vitamin, along with, of course, diets low in healthy fats, and high in sugar. More reasons why I love Butter Coffee are found in my free detox + ebook. Get these and find out how my clients use fat to lose fat, sing up for our free 7 day detox. 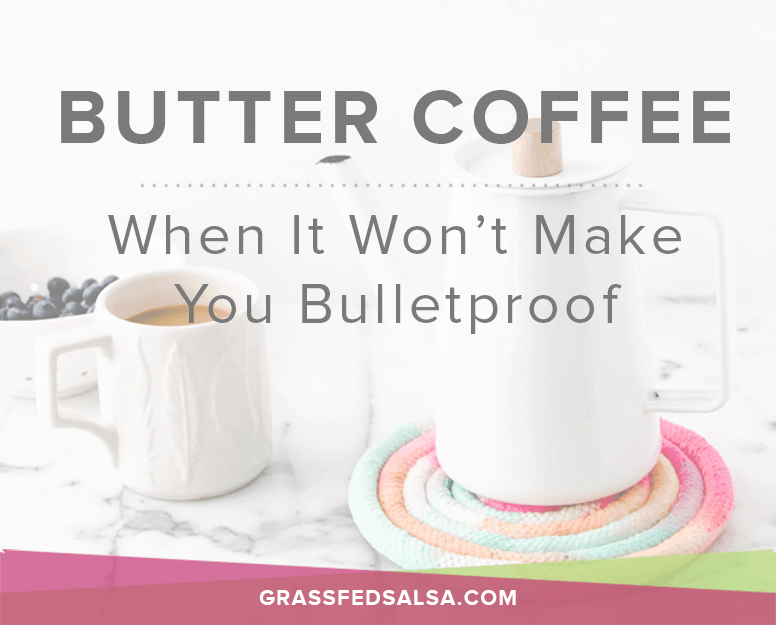 So if it has so many benefits, when will Butter Coffee NOT make me Bulletproof? When eating a diet high in carbs, your body is constantly dealing with excess blood glucose. Since glucose (sugar) is an easily convertible source of energy, your body will utilize it first, and store what it can’t use immediately as body fat. Burning the dietary fat in your coffee along with stored body fat, would be the last thing it would do. Everyone has heard the saying, “Stress will make you age faster.” Well, I’ll give you that and raise you one… it can also make you fatter! Without getting too deep into it, our adrenal glands are in charge of our cortisol production, which is a major stress hormone. We want to keep these little glands healthy and happy, and stress makes them drained and fatigued. If you’re in a state of high stress, intermittent fasting & caffeine consumption will be hindrance to your weight loss and stress management efforts. If you’re super stressed, opt for a nutrient dense breakfast: pasture raised eggs, avocado, caramelized onions and garlic, and cherry tomatoes. For the mildly stressed individuals, choose to drink Butter Tea or our Coconut Milk Tea Latte until things in your life settle down a bit. If your goal is to build muscle mass, drinking Butter Coffee after your workout is going to be counterproductive. After lifting heavy, your body needs a combination of carbohydrates and protein to replace glycogen stores, and repair muscle fibers. Drinking only fat after these types of workouts slows the recovery process. While most sweeteners are not beneficial additions to your Body By Butter Coffee, there can be instances where their addition won’t necessarily impact the blood sugar regulating affects of the drink. Butter Coffee should be incredibly satiating, and keep you full for hours. If you find yourself completely famished an hour after drinking it, it most certainly is not working for you. This could be for any number of reasons: you’re stressed (see #2), you aren’t consuming enough calories throughout the day, your carb intake is too high (which will prevent you from becoming fat-adapted), etc. If you can relate, don’t force it! Stick to a high fat, high calorie, low carb (less than 25 grams if you’re keeping track) breakfast for a couple of weeks and try again. This will help you to transition slowly into a fat burning state. This can be one of two things: you’re stressed or you didn’t eat enough the day before (which in turn, makes you stressed). Either way, if I’m feeling exceptionally hungry, I own it. I eat breakfast instead of fasting with Butter Coffee, I snack when I need to, and I up my portions. Trust your body’s hunger cues and cravings, and listen to them. 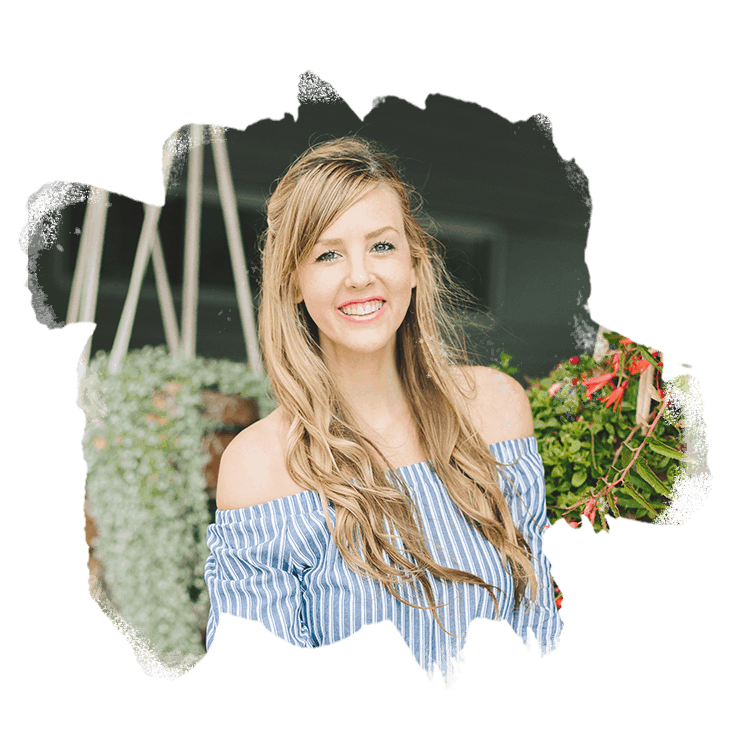 If you shut down it’s craving for solid food, then this Body By Butter lifestyle isn’t any better than any calorie restrictive and dictating diet out there. This one is SO important. Since you’re missing an entire meals worth of food when you choose to intermittent fast with Butter Coffee, you’re also missing out on the micronutrients that would have been found in that meal. Make sure to eat lots of veggies, antioxidant rich fruits, and high quality fats & proteins during the other meals you eat throughout the day. Foods like gluten, corn, and soy… foods that your body doesn’t tolerate. 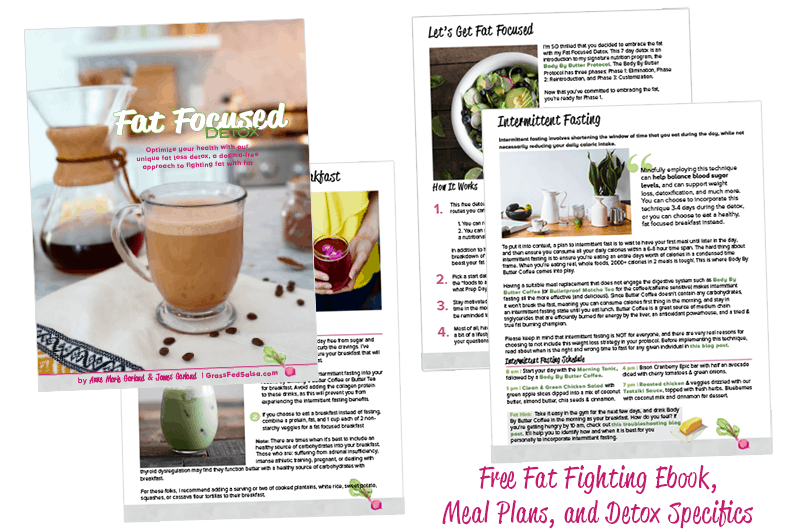 Identify these foods with my Fat Focused Detox + ebook. You can sign up fo’ free! I’d love to know. What has been your experience with Butter Coffee? Good or bad?